Abraham Lincoln is a son of Kentucky, a point he makes during the legislative wrangling over the 13th Amendment, as Steven Spielberg tells it in “Lincoln,” a great new movie that is much different from most cinematic fare today. He was born in Kentucky and raised in southern Indiana, before he became famous in Illinois, the Land of Lincoln. But he was a son of the South, he was saying. It was important to the debate. Kentucky plays a pivotal role in how the vote comes down on the 13th Amendment, to abolish slavery, hinging in part on the young Kentucky representative who heard Lincoln out, but who argued that the country simply was not ready to assimilate 4 million new black people. How do we make it work? Will they now demand a right to vote? We’re not ready! “Lincoln” comes at a good time, as we reflect on an historical passage into the second term of Barack Obama, who idolizes Lincoln not only as the “native son” of Illinois, but also as someone who asked this nation to rise above race, to recognize the humanity in us all. Obama has the potential to be a great president, in the mold of Lincoln, and I hope we give him a chance. In Lincoln’s time, in Lincoln’s words, we were “testing whether (this) nation, or any nation, so conceived and so dedicated, can long endure.” We were testing the basic tenets of our democracy, and our republican system of government – and the purpose of our “Republic” was to preserve the common good, to ensure that government would not be ruled by private interests, but in the public interest. That was the whole basis for the Civil War. That is perhaps one of the more interesting aspects of “Lincoln,” to watch the Republicans as the good guys, the “radicals” for freedom and justice. The Democrats in 1865 fought for narrow interests within their states, with little regard to the public interest. This year, in 2012, we had the Republican candidate for president shilling for people who are the top 1 percent, owning massive wealth, a class he represented well, against the public interest of the 99 percent, who together fight for their dignity, if little else. The Republicans today are still searching to energize a “Real Majority” defined by Ben Wattenberg and Richard Scammon during the Nixon era as very conservative socially, and especially resistant to change, guardians of the status quo. They were more likely to follow George Wallace than to follow George McGovern, as Republican strategist Kevin Phillips argued in “The Emerging Republican Majority,” published about the same time. Today, not a majority, this group is at the heart of the Tea Party. Ironically, Nixon probably changed government to favor the public interest more than any other president in modern times, establishing the Environmental Protection Agency and the Occupational Safety and Health Administration, programs passed by congressional Democrats. He engaged China in a global conversation, and he created wage and price controls that worked. Still, using the Wattenberg-Scammon-Phillips model, Nixon developed a “Southern Strategy” that used racial overtones to turn Dixiecrats into Republicans. By pursuing this divisive strategy, Nixon set the stage for the rise of the Tea Party and the racist birther and “Obama is a Muslim” movements. 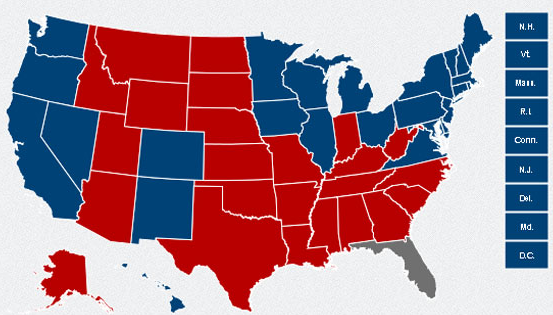 When you look at the electoral map from the 2012 election, you can’t help but see the stamp of the Solid South, with the Mountain West Territories sidling along, all resistant to a new order of rainbow America. This is the legacy of Southern Strategy, as honed by Lee Atwater and Karl Rove and that next generation of windmill tilters, and we can only hope that they are, indeed, history. Listen to Lincoln, as he spoke to Alexander Stephens, the Confederate vice president. during decidedly one-sided negotiations. 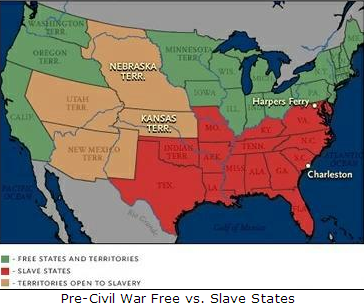 Bluntly, he named the southern states that were likely to ratify the anti-slavery amendment. It would win, he said. Get used to it. Slavery is dead. Today, we are still fighting bigotry, but we have champions for equal treatment under the law, the case that Thaddeus Stevens made so well, if reluctantly in “Lincoln.” We have made a remarkable passage in 150 years. You only have to look at the headlines today, and contrast them with the headlines of 1865. Fine acting and production values give “Lincoln” an Oscar sheen, and don’t be surprised if it wins. And I hope screenwriter Tony Kushner also gets credit for bringing Doris Kearns Goodwin’s “Team of Rivals: The Political Genius of Abraham Lincoln” to life. He is a Pulitzer Prize-winning playwright (“Angels in America”), but the jury is still out on “Munich,” his other film collaboration with Spielberg. There’s no question about “Lincoln,” however: He is a superb storyteller. As we march toward the “Fiscal Cliff” at the end of 2012, it’s worth reflecting on how this House of Representative resembles the House that Lincoln had to confront, except that the enemy were hard-headed Democrats, not Republicans. Can Nancy Pelosi speak as bluntly to John Boehner as Stevens does in lambasting George Pendleton, the Democrat from Ohio who led the pro-slavery lobby. Why not, Nancy? Speak up! Let’s call a spade a spade! As a native Kentuckian, I’ve always felt an immense pride in Abraham Lincoln, a man of the people, born in a log cabin in Knob Creek, Ky., raised and schooled under harsh frontier environments in Kentucky and southern Indiana. He rose to be one of the greatest presidents in the history of the United States, perhaps the greatest. He sacrificed everything to save the Union, to unite us all, whether we wanted it or not. But as I watched the Kentucky legislator at the heart of the struggle to win the 13th Amendment, I couldn’t help but remember that Kentucky did not ratify the amendment until 1976. And that’s shameful. Virginia, where I live now, was the first Confederate state to ratify the Amendment, two months after Robert E. Lee surrendered, and Georgia sealed the ratification in December 1865, the 27th of the 36 states. It took Kentucky 111 more years to get it right. Lincoln would have been sad about that. He would have hoped that his home state would ride the great tide of history, and become part of it, instead of dragging up the rear. Sadly, the modern legislative face of Kentucky is Senate Minority Leader Mitch McConnell, whose No. 1 goal has been to bury Obama. It’s time for some new sons of Kentucky to ride in. This entry was posted in Uncategorized and tagged 13th amendment, best movie, fiscal cliff, history, Kentucky, Lincoln, slavery, Spielberg by bymichael2012. Bookmark the permalink. My favorite post yet. Love the maps!